Able Surveyors enjoy an established reputation throughout Essex, and have been providing detailed, comprehensive reports for buyers in Chelmsford for over 25 years. Our experienced team caters to the stunning variety of property seen across the area, from conducting building surveys of historic rural estates, to providing snagging reports and valuations for the contemporary new-builds springing up around the city. Our Billericay office is less than 10 miles from the heart of Chelmsford, and we regularly survey homes in the city centre, Writtle, Great Baddow and Chelmer Village. As the exciting new Beaulieu development progresses, we are looking forward to helping many more house-hunters secure the home of their dreams by providing snagging lists, valuations and condition reports. Click here to read our case study for an example of our work in Chelmsford. We are only a short drive away from Chelmsford and have spent many years surveying the area. Should you wish to write to us please find our address below. Chelmsford’s housing market has been very promising over the last year, with values increasing by almost 3% in the last six months, and maintaining a modest 0.53% growth in the last 12 months. Detached family homes have seen the largest improvements with a 2.87% value increase over the year, while prices remain steady for smaller, semi-detached (‑0.29%) and terraced properties (+0.07%). Considering the tumultuous year we have experienced, these figures are a clear testament to the expanding opportunities within the city. Whether you are making an investment or seeking a new family home, property values are not the only important thing to look for. An alarming number of potential purchasers still fail to arrange any independent surveys on a property, instead relying on seller information and the mortgage valuation as a green light to proceed. This is a very risky practice, and leaves buyers vulnerable to hidden defects and unpleasant surprises once they take ownership. At Able Surveyors, our job is to investigate all kinds of property to document its condition, and identify any areas of concern before contracts are signed. This may be in the form of one of our RICS property reports, a specific defect report or simply an independent valuation. Our team have worked with a diverse cross-section of Chelmsford property, and will be happy to help you make an informed, impartial decision before you buy. It’s important to us that you are as satisfied with your report as you are your new home, so we always take the time to discuss the most appropriate survey for your needs. Without any kind of survey (or even the wrong kind of survey), you cannot be sure of the underlying condition of the home you are about to buy. At best, you are going into negotiations blind, and at worse you can find yourself repairing thousands of pounds worth of problems, like faulty roofing, boundary conflicts or subsidence, which were not apparent prior to the sale. Commissioning a survey gives you an impartial, professional opinion on any defects or concerns with the structure of your property. You can also receive an independent valuation on the house, and benefit from a stronger negotiating position when you have the full results. What about the mortgage valuation report? It is a common misconception that a mortgage valuation will raise any defects with the property. A mortgage valuation is designed to simply inform the bank or lender whether a property value meets the agreed loan amount, and won’t provide any additional information to the buyer about the legal or structural issues with the sale. 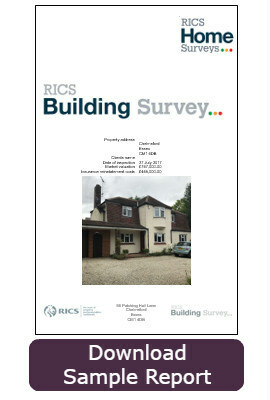 Each of the RICS reports offer a different level of detail and information, and the most cost-effective survey will depend both on the current condition of the property, and whether you are planning any renovations or extensions once you move in. The most important thing is to understand the property enough to make informed negotiations with the seller, and to prevent any unpleasant surprises once you move in. In some cases, buyers choose to walk away from a sale after a survey reveals the extent of work required. To understand the differences between each RICS survey, take a look at our survey comparison table, or contact us to discuss your situation.